Colorado College's Billy Hutchison, a sophomore long-stick midfielder. Billy Hutchison is providing an added dimension to the Colorado College men’s lacrosse team. 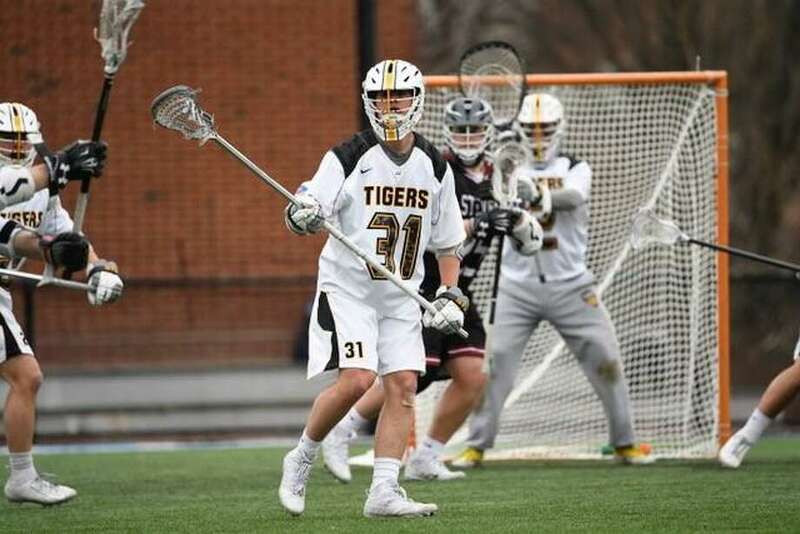 Hutchison, a sophomore long-stick midfielder and 2017 Staples High graduate and all-state player, has been making his presence felt on the field for the Tigers, who are 5-3 as of Wednesday, winning five of their last six games. Whereas long-stick middies aren’t known to score a lot of goals, Hutchison has found the back of the net three times already while also playing strong defense and doing all the little things a LSM is counted on for. Colorado College’s eighth-year head coach Sean Woods said in addition to providing strong defense, Hutchison has a knack for getting open and passing ahead to teammates. “Long-stick middie is a defensive role on paper,” he said. “They think about playing defense and defending the other team’s top midfielder and in that role, Billy is one of the best in the country and I’m sure the opposing teams we’ve faced would agree. Hutchison said the team works on its transition drills and that hard work is yielding positive results. Recently, Hutchison was recognized for what he does well on the field. The sophomore was named the D-III Southern Collegiate Athletic Conference Men’s Lacrosse Defensive Player of the Week from Feb. 25-March 3. Hutchison was appreciative of the honor, but he and his teammates play more for wins in the ledger. During that stretch, against Widener, he recorded a career-high three caused turnovers and tacked on a pair of ground balls to help lead the Tigers to a 21-8 victory. Hutchison also was prominent in CC’s man-down unit, which allowed just two goals in 11 opportunities. That game was the second in what turned out to be a five-game winning streak. Unfortunately, the Tigers lost their last game, a hard-fought 16-15 setback to Sewanee on Tuesday. Woods said it was his team’s first home loss in two years at Washburn Field, which can make it very difficult for opposing teams to adjust to the elevation — approximately 6,000-feet above sea level. Hutchison said he had to adjust himself when he first arrived at CC a year ago. Hutchison isn’t the only Westport resident playing for the Tigers: junior attacker Ross Goldberg and junior face-off specialist Ben Schwaeber have been contributing this season as well. Woods said Staples has been one of the top programs in the state and the trio came in displaying a tremendous amount of skill. “We’re lucky to have that connection,” he said. Hutchison said he had former Staples coach Paul McNulty to help in getting him to where he is now. As for this season, Colorado College is eyeing an improvement of last year’s 13-5 mark, which had the Tigers ranked in the top 20 for the first time. Woods said advancing in the D-III Tournament is at the top of the team’s wish list.